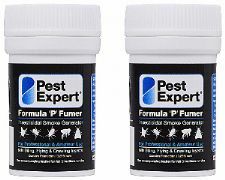 The Pest Expert Formula 'P' Super Fumer Flea Bombs contains 300% more insecticide than a standard Fumer making it ideal for eradicating dog and cat infestations in open-plan living areas. Three times more powerful than a standard Fumer! The Pest Expert Formula 'P' Super Fumer Flea Bomb has three times the power of a regular Fumer, and treats an area three times larger, so is perfect for eradicating flea infestations in open-plan living spaces. After lighting, it releases a permethrin smoke which fumigates a room, killing adult dog and cat fleas. Once dispersed the smoke leaves no residue, so will not taint or damage carpets or furniture. The Formula 'P' Super Fumer is an essential component in any comprehensive flea treatment for the home. To maintain long-lasting flea control, we recommend any fumigation is carried out in addition to applying residual insecticides such as Formula 'C' Flea Spray. 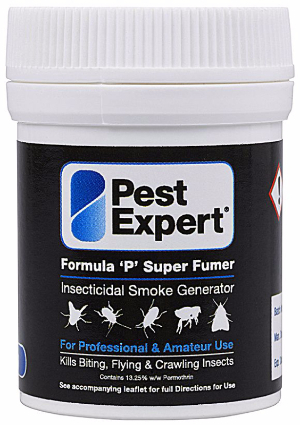 Each Super Fumer contains sufficient insecticide to cover 100 cubic metres, which equates to an area of approx 8m x 5m. To treat more widespread flea infestations, add extra Super Fumers as necessary. The Formula 'P' Super Fumer Flea Bomb is best used in combination with a residual insecticide such as Pest Expert Formula 'C' Flea Spray for longer-lasting flea control. For value for money, please see our Flea Treatment Kits which contain a range of our best flea killer products. Very happy customer, worked well, no more fleas. Super! Products arrived as described and on time too. I was prepared for nothing to work for these fleas as I have tried everything but it worked! No more fleas! Best service and products ever, thank you very much! Worked really well. SUPER is correct! This product worked fantastically, no more fleas! Fantastic company, the super fumer did exactly what it promised to do. 1010 service and products! These super fumers have proved very effective. 100% recommend. These flea fumers are fantastic! Used only once and it got rid of the little blighters! I don't really do online shopping but Pest Expert made the whole experience smooth from start to finish. Flea fumer arrived as expected and it was simple to set off. I have not been bitten by a flea since. Top service, I would give you 10 stars if I could! Ordered this product for the problem I had with fleas. Arrived the next day so I read the instructions carefully and set the super fumer off. Absolutely no hassle, it was super straight forward and killed all of the fleas as im no longer being bitten. Top class products and service, already recommended to you to my pals who need pest control, great work. Bye bye fleas! Always a pleasure doing business with this company. I have used loads of flea killers but this one is by far the best i've used. Great super fumer! Really worked, highly recommend! Not been bitten since using this! Excellent service. I have used Pest-Expert a number of times now and will continue to do so! The Flea Bombs, like all of their products, work really well! These flea bombs produced a healthy amount of smoke and did exactly what to website described them to do! I back them up with Formula C spray and I am now flea free! One happy customer! I have used this company on several occasions and always found them prompt and efficient. They are indeed the pest experts!! Staff were very knowledgeable , professional & helpful also the rapid delivery service was also very good . I would highly recommend this company to anyone in need of their products, also within hours of setting the smoke bomb off there have been no further sightings of any fleas. I was most impressed by the service that was provided and the advice. Website clear, Goods arrived on time and so far a lot less fleas to be seen! A great selection of products in different formats with clear explanations on an easy to use website. Arrived quickly and well packaged. Thank you, I will use Pest Expert again. Good information on the website, good to be able to read other customer reviews when deciding on product, easy to order, prompt delivery and the flea bombs did the job. Would certainly shop here again. I found the service from Pest Expert excellent. The product was of superior quality & good value. I definitely recommend. Pest Expert offers very effective products, which are dispatched promptly. The website is very easy use. I've used Pest Expert several times and intend to again when I need further supplies. Their service is excellent. After putting in the order I received next day delivery. Very securely packaged and well written instructions contained inside. Excellent product. Very fast service and product as described. Second time I have used Pest Expert as product is very effective for eliminating fleas. These products were recommended to me by a friend. The website was easy to use and the delivery very fast. Most importantly they work! Service was excellent delivered next day as I was promised.The flea bomb is great and it does what it says on the tin. The product was delivered on time and is exactly as described, I am very satisfied with both product and customer service. excellent response to my original inquiry followed up by prompt reaction to my order. I will certainly use them again and will recommend them to others in need of their services. Great website, great delivery, products seemed to have worked - all in all a faultless transaction. Product was delivered on time and is effectively got rid of the fleas! User friendly website. Speedy delivery. Straightforward instructions. Job done. I've used products by Pest Expert before to eliminate fleas (different part of the house this time). Instructions are clear, products very easy to use. Item just as described, well packed and good delivery. Thank you - the flea bomb worked really well! Great product, used before and worked well - hopefully will kill all the fleas like last time! Brilliant just what I wanted 👍🏼 Fast delivery super 💫 great product, smoke filled the room and killed the fleas. Easy transaction and the product worked as described. As described, super quick dispatch, very happy thanks, great website and product!